The Homeschool Gossip: Open Day at Lake Norman Homeschool Enrichment Co-op 11/28/17 ~ Openings Available! Open Day at Lake Norman Homeschool Enrichment Co-op 11/28/17 ~ Openings Available! A message from Dawnmarie Uebele Grack: "Do any of you homeschool parents want to come have a blast this Wednesday with your kiddos? This enrichment co-op is amazing for kids and parents, too. We have field trips, games, science experiments, free play, nature exploration, and more. If you homeschool and are interested, send me a PM!" They have space for kids ages 12-15 and 5-7! Are you looking for a co-op for your homeschooler aged 5-15 in the Lake Norman area? 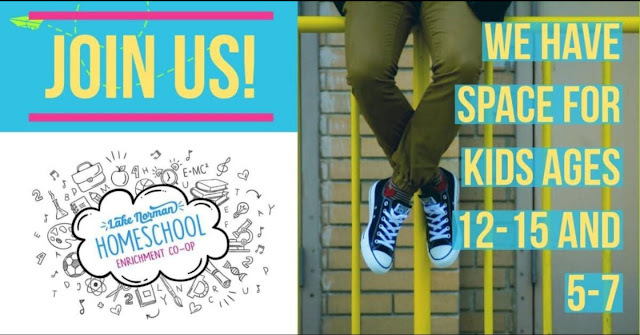 The Lake Norman Homeschool Enrichment Co-op is hosting an open day for all homeschoolers to join us for fun activities and games to see what we're about. Our co-op is a social-based, non-academic co-op where the main goal is to form a community for our kids - and parents, too! And although we are social based we still find plenty of room learning with our activities and field trips. We have a fun, drama-free environment and welcome kids of all different abilities. We meet Wednesdays at 9:30 and the location varies depending on our activity that week. If you have questions feel free to message here.